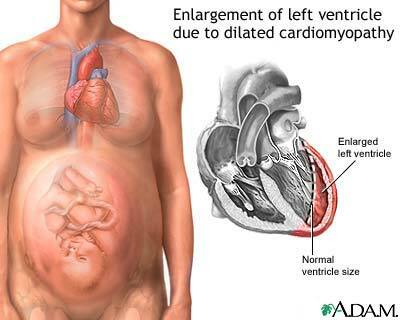 Peripartum cardiomyopathy (a form of dilated cardiomyopathy)is a rare disorder in which a weakened heart is diagnosed within the final month of pregnancy or within 5 months after delivery. In the United States, ppcm complicates 1 in every 1,300 - 4,000 deliveries. It may occur in healthy childbearing women of any age. I happen to be one of those women effected by PPCM, and I hope that you enjoy reading my blog as it will contain my experience with PPCM as well as others things in my life. I visited this page because I wanted to grab the link to share with another young lady that sister has recently been diagnosed with PPCM. What I realized upon viewing that it's been a really long time since I have posted anything here, and so much has changed since July. I won't provide an update tonight, but I will very soon. "In Everyones life ,at some time, our inner fire goes out. It is then burst into flame by an encounter with another human being. We should all be thankful for those people who rekindle the spirit." Love, peace, and heart recovery!!!!! Yes, today was indeed a better day than the previous. I didn't get much sleep, but I didn't feel as depressed as the previous day when I was still absorbing so much information. I tried using this evening to focus on the positives in my life, and developing a plan to get me to where I need to be. Today was also the start of treatments because besides the Thalassemia I am losing iron from somewhere else so the Hematologist referred me to a Gastrointestinal doctor and set me up for 10 Infed treatments to start with. I am hoping that these treatments work because my hemoglobin keeps dropping. The blood panel from my GYN was 10, last week during my Hematologist visit it was 9.8, and today it was 9.1. I don't know, but that seems like a bad decline so I am crossing my fingers. My next appointment is next Friday, and I hope the energy in the Chemo room is the same or better than it was today. Seeing some of the men and women go through chemo is not an exciting thing to see, but the nurses there give the patients hope and try to make them laugh as much as possible. The funniest part was when the nurses were in the mixing room and the lights were flickering, and music playing. One nurse asked what was going on with the lights, and the other responded by saying we are in club chemo. LOL!!! That made all the patients laugh, and from that point more conversations sparked. I was so tired I feel asleep a few times, and could barely physically laugh. Well, at least I thought it was from me feeling tired, but the nurse mentioned that the benadryl was kicking in. LOL!!! That explains why I couldn't keep my eyes open after trying so hard. The only problem that I had today was my blood pressure increased after treatment. When I came in it was 122/77, but after the treatment it increased to 158/83 so I was not released right away. Yikes!!!!!! Well, I will be interested to see if these treatment help, and anxious to see the Gastro doctor next week to figure out where the blood-loss is occurring. This morning I woke up happy to celebrate the second birthday of my Princess. I was also excited because I was scheduled for a echo-cardiogram today, and I just knew that based on how I have been feeling that my heart had gotten better. During the echo I noticed something slightly different from the norm, but did not ask the tech about it. I was still feeling pretty confident that my EF had increased or at least remained the same. I had an appointment for the same day results so I also had an EKG, and saw my doctor to explain the results. It took awhile because she went back looking at previous EKG's and what was suppose to be good news for me wasn't. I was informed today that I have developed a bundle branch block, and the thing that makes me nervous is that I have been feeling better and much stronger. I just knew that today we would have discussed coming off the meds, but that may never happen. She explained to me about how the heart functions when it develops a BBB, and I listened. Especially, to the part about how she is trying to prevent me from having to get a pacemaker. AHHHHHHHHHHHH!!!!!!! Yes, that was the thought running through my head because I just can't understand why this is happening to ME. My next appointment which would have normally been in 6 months has been scheduled for 6 weeks because of the bundle branch. I left the appointment, and it didn't sink in about what had just happened in that office until I got to Walgreens to buy a bottle of water. As I drank the water it flowed from my eyes, and as much as I tried it wouldn't stop. I hoped on FB looking for a funny joke from one of my friends, but posted "Really not understanding this black part mediterranean body of mine. How could one feel so much strength and confidence of getting better only to find out that the opposite it occurring inside. **Sigh! ** At this rate these meds will be a staple in my life. **Sigh**" That was my thoughts at that moment, and I couldn't help but to think anything else. I picked up my children from daycare which rejuvenated a smile, and proceeded to see my friends to celebrate my daughters birthday. Although I couldn't get my mind off today's appointment being surrounded with friends kept me distracted. Now "Fat, sick, and nearly dead" truly means something to me, and the good thing is that I just received an email saying that my juicer has been delivered. Starting on Sunday I am going on a 60 day strictly raw diet. I am at t he point where I will try anything that does not compromise my health. Well, my next appointment is in 6 weeks, but I won't wait that long to post something. I need to really listen to my body, and focus on getting better.